Segway Inc. will sponsor the closing ceremonies at the 2013 ‘Woz’ Challenge Cup, an international Segway polo tournament, which is hosted annually at different locales throughout the world. This year’s event will be held at Gallaudet University’s Hotchkiss Field in Washington, DC from July 20 – 24, 2013 and has drawn 20 skilled international teams to compete.Tournament play will take place over 3 consecutive days. The final day of play will feature a Championship round as well as a key note speech by Rod Keller, President of Segway Inc., at the closing ceremonies reception and dinner. The concept of Segway Polo began gaining popularity in 2004 after a group of Segway Personal Transporter (PT) fans, known as the Bay Area Segway Enthusiasts, simply substituted a Segway PT for a horse and began competing. 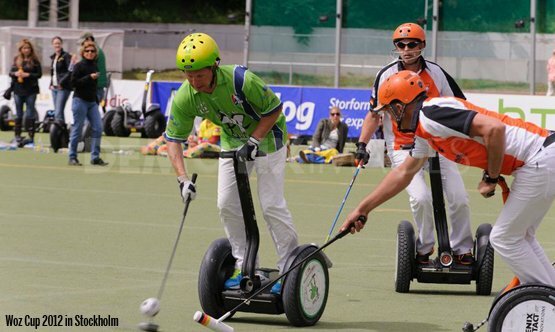 Today, the game is governed by the International Segway Polo Association (ISPA) and teams from countries including Austria, Barbados, Germany, New Zealand, Sweden and the United States regular compete in tournaments across the globe. A regulation field is 200 feet (61 meters) by 128 feet (39 meters). The goal is 8 feet (2.4 meters) wide by 5 feet (1.5 meters) high. A match consists of four 8 minute periods of play, which are called chukkers. The mallet must be held in the player’s right hand at all times. The ball may be struck with the mallet, any part of a player’s body or the Segway PT. The ball may only be directed using the mallet and it must be used to score official goals. The player following most closely to the line that the ball is traveling has the ‘right of way’. A player may hook another player’s mallet if that player is attempting to strike the ball. However, the hook may only occur during a downswing. A complete version of the rules, which have been tailored to tournament play, was adopted by the ISPA in 2007.